Set on the end of Jetty Road, Barwon Head, At The Heads is a unique wedding venue when you plan a beach wedding in Great Geelong area. It can accommodate up to 130 people for a seated function. At The Heads offers both outdoor and indoor options for your wedding ceremony. 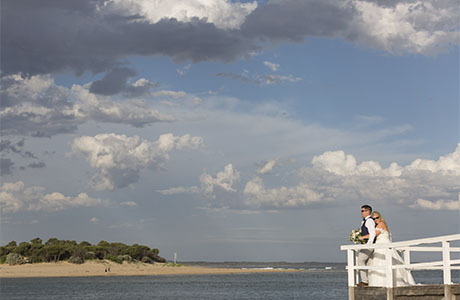 An outdoor wedding ceremony set on the beach with the stunning view of Barwon River and the Ocean is the popular option when the weather allows. When the weather goes a bit crazy, the experienced coordinator will help you to move into the Mulloy Room or the Main Room. For the post-wedding photography, there are plenty of locations we can choose to fit the beach wedding theme. The simple choice is to go to the end of Bluff Road or the Raff Beach on the other side of the Barwon River. Your wedding photographer will seize opportunities to create some artistic wedding photos. As a wedding reception, At The Heads offers superb food and drinks, friendly service and an unbeatable natural backdrop. It delivers a truly rustic and relaxed atmosphere for your celebration. As a wedding photographer, I have been here capturing several weddings. 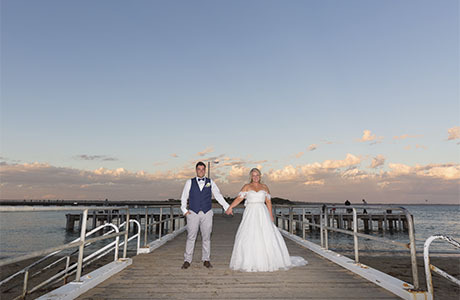 It is definitely one of the most iconic beach wedding venues in the Great Geelong area. Should you have any questions to plan a wedding at At The Heads, please do not hesitate to contact us for the suggestions and information.